Cicadas. A seasonal fixture of Japan so relentless that centuries of haiku masters had only to mention the word to conjure up all the steamy lethargy of summertime. If you’ve ever been here May-September, you know why. There are thousands and thousands of them hiding in trees and bushes, and they’re LOUD. Really loud. You can hear them through closed windows. After a while, though, you get used to the constant screeching. It becomes a sort of reassuring background soundtrack to summer. Until you see one. That hand up there in the picture? It belongs to an 18-year-old, not an 8-year old. 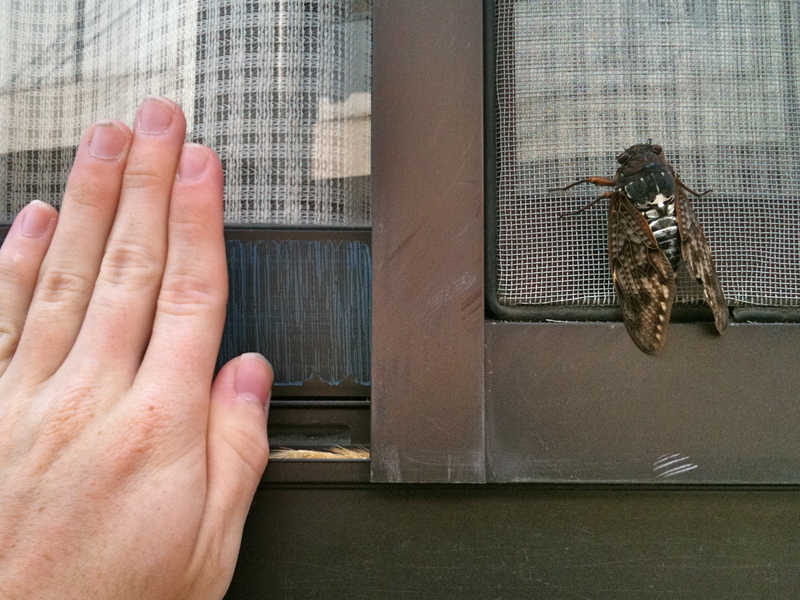 Now that I’ve seen a) how huge they are and b) that they can FLY…aieeee! Agh! We have them here too–I wonder if there the same species, and that BIG? I did not want to know that, since it usually sounds like there’s about 10,000 in my yard. You know, after I saw this one, I actually peered into the tree outside my window and saw one on the trunk. Then another one. Then another. It was shocking how many of them there are! Why is it that some creatures are more beautiful in large numbers (fish, for example) and others are amore horrible (see above)?